Motorola MC3200 Straight Shooter - Straight shooter, 2D Imager, Windows Embedded Compact 7, 38 key Keypad, Wi-Fi (802.11a/b/g/n), Bluetooth, Standard Capacity Battery, Expanded Memory. Interface cables and charging cradle sold separately. Single slot charging cradle kit (Part# CRD-MC32-100US-01). Four slot charging cradle kit (Part# CRD3000-400CES). Redefine productivity and reliability with the MC3200 mobile computer, the next generation in the class-leading MC3000 Series, now with more options to meet your needs. Choose the right operating system for your business - Android Jelly Bean or Microsoft Embedded Compact 7. Your choice of our most advanced 1D laser or 1D/2D imager scan engine allows your workers to easily capture barcodes in any condition. Three lightweight models - brick, gun and turret - bring all day comfort to every task - from cycle counting to putaway, replenishment and voice-directed picking. 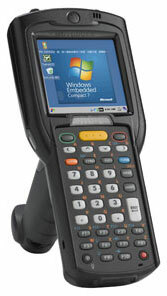 And since the MC3000 Series has been one of our most popular mobile computers for over 10 years, you get a tough and tested mobile computer you can trust to take your inventory management efficiency to the next level. 4 Slot battery charger for the MC3200. Includes power supply and line cord. 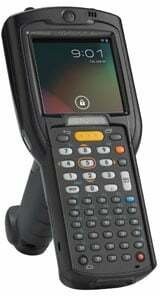 The Motorola MC32N0-SI3SCHEIA is also known as MOT-MC32N0SI3SCHEIA	or MC32N0SI3SCHEIA	.